Le Bleu water is ideal for homes, offices, and events. Whether you rent a water cooler from Le Bleu or have your own, we can deliver 3 & 5-Gallon water and coolers to your home and/or office. Like all Le Bleu Ultra Pure Water products, our 3 & 5-Gallon water is bottled in a non-toxic, BPA free container. Le Bleu water bottles also feature sturdy handles for easy replacement. In addition to the 3 & 5-Gallon we also offer scheduled deliveries of our individual 12oz., 20 oz., 1 Liter and 1.5 Liter bottles by the case of Le Bleu Bottled Water. Our bottles are far sturdier than our competitors’ and are made with BPA free bottles. Le Bleu Premium Water Bottles are an elegant choice for special events or occasions in a signature cobalt blue plastic or clear bottle. And our Private Label water is an excellent choice for special events and marketing your brand. Our process creates uniquely pure water, free of any contaminants, perfectly balanced and fresh tasting. There is no water purer, healthier, or better tasting than our Le Bleu Ultra Pure Water. A well-stocked breakroom for your employees will keep everyone happy and productive. With Le Bleu coffee delivery service, you’ll always have a reliable source for breakroom amenities – no matter the size or needs of your office. We supply the finest gourmet coffee, teas, and hot chocolate to accommodate every preference in your group including Green Mountain, Starbucks, Krispy Kreme & Donut Shop. Whether you are looking for the perfect brew for yourself and your family or you have a whole office of coffee-drinkers to satisfy, we have what you need. 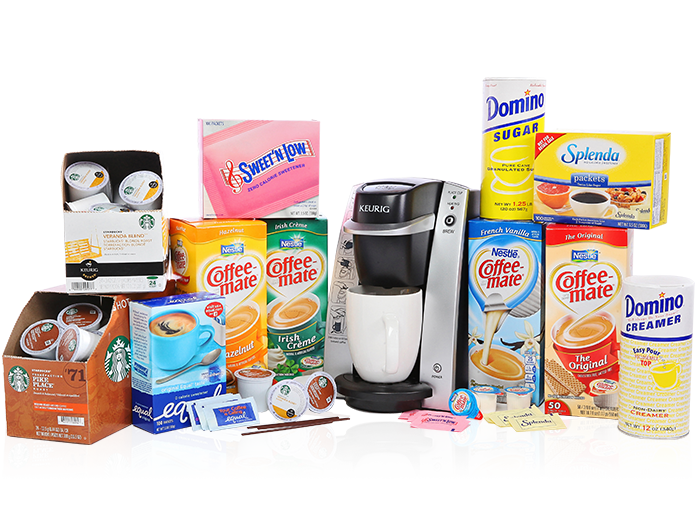 We also have a wide variety of Keurig brewers to choose from which can accommodate your home or office. Our convenient delivery allows your team to focus on growing your business, not carrying supplies. Our Ultra Pure Water. Your label. With our custom labeling service, you can turn your favorite 12oz. or 20oz. Le Bleu Water bottle into a handheld billboard! Bottled water is an excellent advertising medium. Achieve maximum advertising exposure with Le Bleu’s Private Label Program. By customizing our Le Bleu Ultra Pure Water bottles with your company or event logo and story, you have a unique opportunity to advertise and raise the visibility of your brand. We are the largest custom label water provider in North Carolina. We make it easy to order, and our experienced graphic design department can work with you to provide a high-quality label design to maximize your promotional needs.